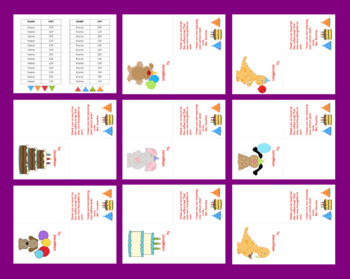 Thank You Notes for Birthdays - EDITABLE! 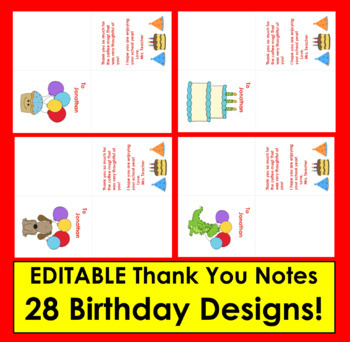 Thank You Notes: For Birthdays - Editable! 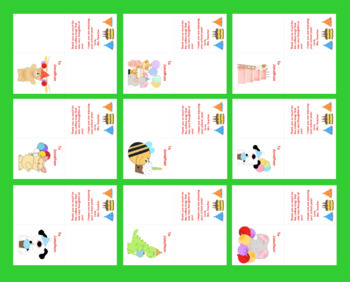 ★ Thank You Notes Ready to edit and personalize for each student. ★ OR mail them! Students LOVE to get mail!! ★ I always send a note to every student regardless of whether they gave me a gift or not. I simply write a little note to them thanking them for celebrating using the same form as the thank you note. Gift List: Simply highlight the word “student”, and type each child’s name. Then write each gift as it is given. 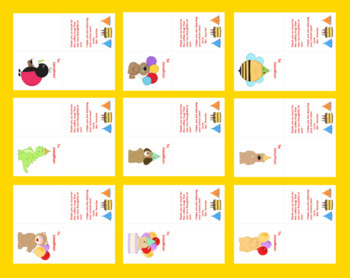 Thank You Card: On the front of the cards, highlight “Name” and type in a student’s name. Inside, highlight “the delicious cookies”, and type in the gift each child gave you. Highlight “Ms. Teacher”, and type in your own name. You can change the word “Love” to “Your teacher” or whatever you like. You can even replace, “I hope you are enjoying your school year! !” with something personal for each student. You can use these cards every year!